Baby strollers are an important investment for parents and expectant parents. They provide convenience and portability for exercise, everyday travel, and maintaining an active lifestyle with an infant, toddler, or small child. The best baby strollers are durable, reliable, and safe. They may have any number of different functional and safety features. Their construction quality, portability, and maneuverability can vary widely. With a myriad of models, styles, and features, finding the best baby stroller can be an overwhelming task. Fortunately, we’re here to help! We’ve gone through an exhaustive review of some of the top-selling and best-reviewed baby strollers that are currently available and culled the list down to the top 5 baby strollers on the market today. There are many critical criteria upon which these baby stroller reviews are based. For each of these categories, we’ve attempted to provide a rationale for why the criteria matters. The expression “safety first” is familiar to most everyone, and we, like baby stroller manufacturers, take safety seriously. When it comes to children, parents can’t be too careful – safety has to be first and foremost in their mind. The features and functions of a baby stroller include how children are secured in the product, whether or not it accommodates different ages and sizes, how adjustable or customizable it is, how easy it is to push and use, etc. This category also includes the ease of use of the product – how simple or complex it is to use on a regular basis, to collapse, disassemble, and store, to put children in or take them out of, and similar measures. Durability is a measure of the quality of construction, reliability, and solidity of a product. It also includes stroller-specific metrics like the type/quality of wheels and handles, how well the product works on different terrains (pavement, sidewalk, grass, mulch, hills, etc. ), and so forth. This is a measure of how easily the product breaks down for transport and storage, as well as how easy it is to reassemble for use. It includes considerations like the systems used to break down the product, as well as the overall weight, bulkiness, and other features. Another indication of product quality is consumer reviews. Therefore, we’ve included the review score from Amazon.com and considered that as part of our review process. The bottom line for many products and consumers is often the purchase price. All the features and qualities in the world are great, but if that comes at a cost that is wildly more than the competition, the product may not be a real value for consumers. With that said, let’s look at the ratings and reviews of the Top 5 Best Baby Strollers for 2018. The Chicco Mini Bravo Plus Stroller is hands-down our pick for the best overall stroller. It offers a very high maximum child weight compared to other strollers while keeping the overall weight of the stroller itself relatively low. It’s collapsible, with a quick-fold feature, and accepts the company’s KeyFit and Fit2 style car seats in addition to the provided stroller seat. The convenient parent cup holders and storage show a real commitment to the overall design. Front wheels’ swivel for pinpoint navigation and the one-touch foot breaks ensure safety when the stroller is stopped. Construction is durable, though the wheels could be slightly better – that’s one of the only points for improvement on this product. Consumer reviews reflect this near-perfection, averaging 4.8 on Amazon. All of these features are combined with a relatively low price compared to other strollers we reviewed, making this stroller a great value. Wheels don’t work great on rough terrain. 4.9/5 stars. The wheels are one of the only weak points in this product. Everything else is spot on at a very reasonable price compared to competitors. Rave reviews from consumers and a number of thoughtful features really set the Chicco Mini Bravo Plus apart. The Pockit Lightweight Stroller from GB is a 2014 Guinness World Record winner for a most compact stroller, and the weight and portable size certainly prove that! For travel or lightweight strollers, that still have a high weight capacity and quality construction, the Pockit Lightweight Stroller is the gold standard, and our pick for Best Lightweight Stroller. While the lightweight necessitates less durable material than some other strollers, and there is no car seat integration, the stroller gets high marks in most other areas. Double pair swivel wheels, storage, a small canopy, and adjustable 5-point safety harness provide most of the features of competitor products. It is lacking, however, in performance on rough terrains, such as gravel or mulch, and is best suited to pavement and sidewalks. Consumers are happy, with an average Amazon review score of 4.4. 4.6/5 stars. The lack of certain features is a necessary tradeoff for the weight and compact nature of this stroller. It could work better on rough terrain. Not necessarily a replacement for every day, full-featured stroller, but when it comes to travel and compact needs, the Pockit Lightweight Stroller can’t be beaten! The Roan Rocco Classic Pram Stroller provides the convenience of having a stroller that grows with your child, with the classic form and styling of a pram. Featuring a bassinet that can later be replaced with an included chair, turning the pram into a stroller, it is heavier than most of the competition, owing to the durable construction and high-quality wheels. While it is not fully collapsible like some strollers, it can be easily disassembled into a smaller footprint for storage or travel. It works great on almost all terrains, including rough surfaces like mulch or gravel. The main drawback of this stroller is the price – but remember it is replacing two different types of strollers and is extremely durable. 4.2/5 stars. While this stroller/pram combo offers nice features from both of those styles, it falls short in some areas – weight and lack of swiveling wheels, for example. However, it is strong, durable, handles well, and designed to last several years, transforming from a pram to a stroller as your child ages. This product is a premium, and you pay a premium price. The Chicco Viaro Stroller Travel System offers one of the most convenient features of any stroller – the seat used in the stroller doesn’t just accommodate a car seat, it IS a car seat! Seamlessly transitioning from stroller seat to car seat, and performing excellently in both of those roles, is quite impressive. Featuring an aluminum frame, this stroller does everything a normal stroller does and does it well. There are lots of quality-of-life features, including pretty much everything possible – canopy, storage, cup holders, bumper bar, swivel wheels, and more. Consumers appear satisfied, with an average 4.6 review score on Amazon. The only real negative is the price, but consumers are essentially getting a car seat and a stroller for the price, so naturally a price premium is expected. 4.6/5 stars. Despite being a bit bulky and on the expensive side, the dual stroller/car seat function sets the Chicco Viaro on a different level than many other strollers on the market. 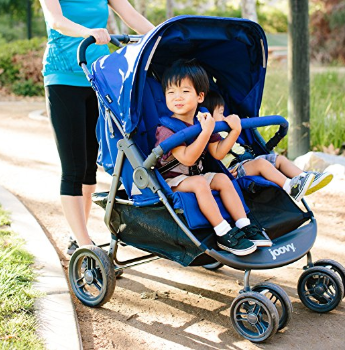 The Joovy Scooter X2 Double Stroller is the perfect solution for parents with two children of stroller age. It has many of the features of a single stroller while allowing for two occupants to safely use the stroller, all for the same price (or less) than any single user strollers. One of the biggest concerns with some double-wide strollers is whether or not they will fit through doors. At only 30 inches wide, it should fit through standard doors easily. In addition, it features heavy-duty front swivel wheels, a reinforced bumper bar, and more. The average Amazon review score is 4.5. 4.5/5 stars. While lacking some of the more exotic features found in single-user strollers (cup holders, the ability to accept or transform into a car seat, etc. ), this product is affordable and high-quality. For two-user strollers, the Joovy Scooter X2 Double Stroller is unmatched in terms of maneuverability, function, and value.